Bishops of the Russian Orthodox Church from Russia, Europe and North America surround Patriarch Alexy II, front row with scepter in hand, outside the Moscow cathedral after the unification ceremony. It didn't make the local news, but the May 17 history-making event in Moscow generated major excitement for millions of people including a small church congregation in Hawaii. Local folks sought Internet sites to watch two elements of an ancient branch of Christianity mend a rift that dated back 80 years to the onslaught of communism. Leaders of the Russian Orthodox Church in the old country and the church abroad embraced and agreed they are in "canonical communion." The solemn pageantry at Christ the Savior Cathedral was a dance on the grave of "godless communism," at least the European variety. The church survived the now-defunct Soviet Union's brutal efforts to shut it down through "nationalization" of property, mass murder of its clergy and persecution of its members. When an earlier patriarch -- the top bishop -- declared accord with the atheist regime, whether it was a treacherous union or a survival tactic, it drove the church abroad to sever its ties. Current Patriarch Alexy II recanted that loyalty oath during restoration talks that began after the Soviet Union crumbled in 1991. In a time when new Christian congregations pop up like spring flowers, created by a charismatic preacher or "planted" in the burgeoning evangelism of the 21st century, not everyone can grasp what is so important about the tie that binds. Orthodox Christianity takes the link with the past seriously. The Orthodox Church considers itself the most authentic teacher of Christ's message. It claims apostolic succession, tracing today's bishops back to the first disciples. The Rev. Anatole Lyovin, pastor of the Holy Theotokos of Iveron Russian Orthodox Church in Honolulu, attended a ceremony involving the signing the act of canonical communion as hundreds of clerics watched. The Russian Orthodox Church is just one element of Orthodox Christianity that divided into autonomous territorial or ethnic churches centuries ago. It has about 125 million members, according to church sources. 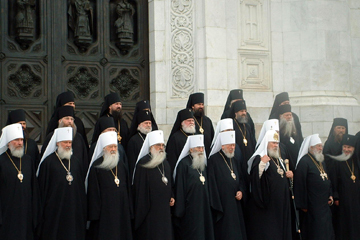 The Russian Orthodox Church Outside Russia, known as ROCOR, claims about 400,000 members. Metropolitan Laurus, the New York-based head of ROCOR, joined Patriarch Alexy II in formally signing the act of canonical communion while hundreds of other clerics watched. "It was wall-to-wall priests," said the Rev. 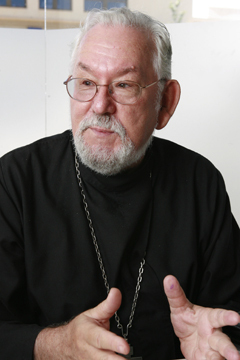 Anatole Lyovin, pastor of the Holy Theotokos of Iveron Russian Orthodox Church in Honolulu. For the priests it was standing room only for the six-hour ceremony. "I wouldn't have believed I'd see the president of Russia standing at the royal doors," the entry to the altar, said the local priest. President Vladimir Putin told the gathering that the reunion "is good not only for the church, but for the country," Lyovin said. "Putin said it is a step in restoring the moral values of Russia." 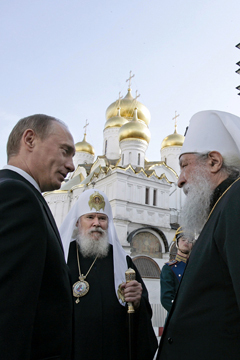 He said that the opulent Moscow cathedral is symbolic of the renewed status of the church in Russia. It was destroyed by the Soviet regime and replaced with a swimming pool. "After the Soviet Union fell, the mayor of Moscow collected funds and rebuilt it using the original plans," Lyovin said. The chicken-skin experience continued in the following days. The crowd reassembled in Butovo, where thousands of people were massacred and buried by Soviet secret police. Patriarch Alexy II and Metropolitan Laurus consecrated the Church of the New Martyrs there. "I remember all the people who didn't live to see it," said Lyovin. "My father predicted that the persecution would end someday and the church would survive and reunite. My mother lived to see the end of the communist regime, the old flag restored instead of the hammer and sickle. She said, 'What was it all about?'" Russian President Vladimir Putin spoke May 19 with Moscow Patriarch Alexy II, center, and in the Cathedral Square at the Kremlin before a reception marking the Orthodox Church reunion in Moscow. Russian Orthodox leaders signed a pact to heal an 80-year schism between the church in Russia and an offshoot set up abroad following the Bolshevik Revolution. Lyovin's parents were born in Russia, escaped to Yugoslavia, where he was born, then immigrated to Toronto. With degrees from Princeton University and the University of California at Berkeley, his first career was as a linguistic professor. He retired from the University of Hawaii just at a time when the local congregation and the hierarchy on the mainland were seeking a permanent priest. They had been served by visiting priests, who were usually not available for Easter, Christmas and other holy days. A visiting monk polled the congregation, and "he talked to my wife first and she agreed." And then he asked Lyovin to become a priest. "I expected to do a year of study. Instead he said, 'Come to San Francisco and we'll ordain you next month.'" Besides being a "cradle Orthodox" and having academic credentials, Lyovin speaks the Slavonic language used in church services. He was ordained in 1999. "They say they can train a priest in 10 days," he said. The Hawaii congregation holds services in an apartment at 931 Hausten St. "Don't look for an onion dome," said the priest with a laugh. English-language services are at 6:15 p.m. Saturdays and 9:30 a.m. Sundays. Without the traditional "babushka," or grandmother, to bake the communion bread, that task has fallen to Lyovin. The Hawaii congregation is typical of others in America. Many of the "old-timers" are descendants of Russian immigrants and do not speak the mother tongue. It also has converts from other ethnic groups, which would be rare in Russia. Among them is the priest's wife, Emiko. Meanwhile, there is an influx of new Russian immigrants. Some of them are "Internet brides," not all of whom can be married in the church. The church sanctions marriages only with Orthodox Christians, Catholics, Episcopalians and Lutherans, he said. Lyovin said he sees the legacy of generations raised without religion in their questions and practices. There is a mixture of superstitions, such as belief in spells and curses. "Some want to have their kids baptized, and here the paganism shows: They say, 'I want to ward off the evil eye.' Sunday school was forbidden, so what they learned was from their grandmothers. "Atheism survived the Soviets," Lyovin said. "Some who come here will tell me, 'I grew up not believing in God, and I can't change.' I tell them there's no button you can push to have faith."